A price taker, in economics, refers to a market participant that is not able to dictate the prices in a market. Therefore, a price taker must accept the prevailing market price. A price taker lacks enough market powerMarket PositioningMarket Positioning refers to the ability to influence consumer perception regarding a brand or product relative to competitors. The objective of market to influence the prices of goods or services. The goods are homogenous – A bushel produced by one farmer is identical to the bushel produced by another farmer. Therefore, there is no brand loyalty. There are a large number of buyers and sellers – There are a large number of buyers and sellers such that none of them is able to influence the market price. A farmer cannot deviate from the market price of its product without running the risk of losing significant revenue. Buyers can access perfect information – Buyers can easily obtain price information and therefore would seek out the lowest price. Ease of entry and exit – Although agricultural production offers some barriers to entry, it is not difficult to enter the market. To reiterate, in a perfectly competitive market, the market determines the price. For example, the world price of wheat is set at Price* (In a perfectly competitive market, the market price is set by supply and demand). Each farm can sell as much as they desire, but will not set a price higher or lower than Price*. If a farm sets a price higher than Price*, none of the buyers will purchase from the farm. Alternatively, if the farm sets a price lower than Price*, it would not be advantageous. In perfect competition, each farm only produces a tiny fraction of the world supply of wheat and would not attract a significant amount of additional demand. The farm would be better off setting a price of Price*. Therefore, the farm must only consider how much to produce based on the price set by the market. Since the price (Price*) is constant, the marginal revenue would be the same as Price*. To maximize profit, a price taker must produce at an output where the marginal revenue (MR) is equal to the marginal cost (MC). In other words, the additional revenue generated from selling wheat must be equal to the additional cost of producing that wheat. Therefore, Price* = MR = MC to maximize profit. As shown in the diagram above, based on the farm’s marginal cost, the ideal output would be at Q* where MR = MC. 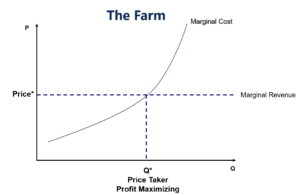 The price taker (the farm) would produce Q* at Price*. The example above illustrates that in a perfectly competitive market where the price is set by supply and demand, a single company cannot influence market prices and must accept the prevailing price set by the market. Price takers must accept the prevailing market price and sell each unit at the same market price. Price takers are found in perfectly competitive markets. Price makers are able to influence the market price and enjoy pricing power. Price makers are found in imperfectly competitive markets such as a monopolyMonopolyA monopoly is a market with a single seller (called the monopolist) but many buyers. In a perfectly competitive market, with a large number of sellers and or oligopoly market. It is important to note that it is hard to find a market with perfect competition (hence, a price taker market participant). For example, a large majority of products incorporate some degree of differentiation. Simple products such as bottled water vary in brand identity, purification method, etc. In addition, several markets face high start-up costs or strict government regulations, which limit the ease of entry and exit. Therefore, is it unlikely to observe perfectly competitive markets in the economy today. 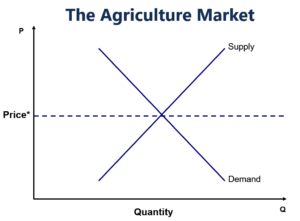 The closest market that exhibits perfect competition would be the agricultural market (illustrated in the example above).